Labour's new tuition fee policy has certainly caused a few ripples in the electoral pond but not necessarily in the right places. As has been pointed out elsewhere the plan is to cut tax relief for pensioners so as to knock £3,000 off the cost of studying. However, the effect of this ruse is to help the well-off rather than those who need it most. Labour's new policy means that only graduates with a starting salary of at least £35,000 will pay less. Much as I dislike the system it is currently working in that there are now a record number of applicants from disadvantaged backgrounds. If Miliband wanted to make a difference he would have done well to have used the money instead to bolster maintenance grants by a lot more than they propose instead. All in all the whole policy looks like a mess. Will the lights go out under Labour? The Sun has already reported on the views of a senior energy consultant that Labour's proposed energy price freeze has already cost each household £70. They say that Tim Ham of Pearson Ham believes that the threat of a Labour Government freezing bills meant the “Big 6” suppliers are worried about cutting bills and then being unable to put them up if costs spiralled. He estimates that average gas bill, currently £695 a year, could be around 10 per cent lower if the energy market was allowed to operate without the threat of political intervention. He added that Labour’s claim that it only wanted to “cap” bills has exactly the same effect on suppliers as the threat of a freeze. Ed Miliband vowed to freeze domestic energy bills for 20 months if he won the Election. However, since his pledge, wholesale gas prices have tumbled by 33 per cent but suppliers have only announced small cuts from the start of January. Now the Telegraph has joined the fray with their report of a key note speech to business leaders at which the Labour leader was present, in which Mark Carleton, services director at Mestec, a company which measures factory performance has warned that "new power investment" is "desperately needed" and that the energy companies will need to make "massive investments". His concern is that these investments will not be made if prices are capped: He said: "Power generation capacity margins are at historic lows. Investment in new power generation is desperately needed. The Labour party's apparent position is that energy company's profit margins of between 3.5 and 4.5 per cent are excessive. "What level of profits would you regard as acceptable, and do you believe that profit margins of below the current levels are going to be sufficient to incentivise energy companies to make the massive investments that are required to keep our lights on? Or do you believe that the funding to build new generation facilities is going to come from elsewhere." All-in-all, Ed Miliband has a lot of food for thought as to how this cap will work, if it is desirable at all in the face of falling energy prices. Just in case we needed another reason not to vote for the Conservatives, the Environment Secretary provided us with a good one yesterday. She told us that if her party wins the General Election then thousands more badgers will be shot, allegedly to protect cattle from tuberculosis. Her evidence for this nonsense is that bovine TB has reduced in Gloucestershire and Somerset following culls. However, she fails to mention that the culls in both these counties failed to meet their targets and as such the attempt to eliminate the wildlife reservoir of TB was unsuccessful. It follows therefore that the reduction in bTB is due to something else, such as for example better cattle control measures or just a variation in the cycle of the disease. Nor does she refer to the reduction in bTB in cattle in the North Pembrokeshire area where there has been no cull. Instead the Welsh Government has instigated a programme of badger inoculation alongside the better cattle control measures. In short the Environment Secretary is grasping at straws to justify previous failed policies and in an attempt to win the votes of farmers who prefer a simplistic shoot first and ask questions later solution instead of one that is backed by evidence. I have long been an opponent of mass medication, otherwise known as adding fluoride to our water supply and have written on the subject on this blog. Yesterday's Telegraph underlines my instinctive prejudice against such a measure. “The difference between the West Midlands, which fluoridates, and Manchester, which doesn’t was particularly striking. There were nearly double the number of cases in Manchester. If this stops the fluoridation lobby in its tracks then that can only be a good thing. The Conservative MEP for Wales has got herself in a bit of hot water today with her suggestion that bankers should be “innovative” so as to flout rules that would cap their bumper bonuses. The Western Mail reports that the party’s MEP Kay Swinburne was caught on tape alongside a Tory MP talking to an audience in the City outlining how the Conservatives had opposed new European rules limiting how much bankers can make on top of their salaries. She told her audience there was no public appetite to revoke the cap and suggested they “get around it” instead. She told her audience: “I can tell you there is not a single constituent I have met that actually thinks we were right to have taken that to the courts. Clearly, Ms. Swinburne cannot be talking to many constituents at all as all those I speak to think it is absolutely right to cap bankers' bonuses and want to know why the Government is wasting public money opposing this in the courts? It seems that whilst UKIP are confident that they can win the Great Grimsby constituency at the next General Election, the retiring Labour MP, Austin Mitchell is not so sure. The long-serving Labour MP, who is stepping down at the election, has represented the constituency in north Lincolnshire since 1977 and Labour has held it since 1945, but Nigel Farage’s party polled strongly in the area in recent local elections and in the 2014 European election, while a recent Lord Ashcroft poll suggested it only trailed Labour in the seat by one per cent. And they say UKIP has got a problem with senior politicians commenting whilst having their foot firmly inserted in their mouth. I know that Liberal Democrats have nothing to boast about on tuition fees. We let people down and we are being punished for that. However, the outcome of that debacle, more by accident than design it has to be said, is that we have created an effective graduate tax, in which the principle of no up-front fees has been maintained, the vast majority of students will not repay the full amount, if they pay anything at all and which is actually leading to more people from deprived backgrounds going to university. Labour's record on this issue is far from perfect as well. They introduced tuition fees in the first place and then brought in top-up fees. In both instances they broke firm manifesto promises, and they had a majority. How they deal with the present situation is therefore a big dilemma for them. At first they thought that they might bring in a graduate tax, but then they realised that this is what is already in place. So they opted for the simple solution of reducing the maximum fee from £9,000 to £6,000. However, that has hit the rocks as well, for two simple reasons: they cannot find the money to pay for it and, more importantly, because that reform actually helps the better off and does nothing for students from poorer backgrounds who are unlikely to repay the money anyway because of the minimum income rule. Now Labour have hit on the worst of all worlds. According to today's Times, Ed Balls is considering cutting some of the tax breaks handed to those saving for a pension to find the £2 billion needed each year to reduce fees. The paper suggests that money could be saved by lowering the £40,000 that savers are allowed to put towards their pension each year tax free, or by cutting the £1.25 million lifetime limit on the amount of pension savings that are spared tax. Another option would be to change rules that allow savers to take 25 per cent of their pension pots tax-free. Capping such withdrawals to £36,000 would save £2 billion. Either way many pensioners will suffer. In a speech that revealed the deep tensions within the party over the policy, he warned that Labour would have to make up the difference through direct taxation to ensure that universities did not lose out. University vice-chancellors have already sounded the alarm over the policy, which they claim could leave a shortfall in their funding. In a letter to this newspaper this month, they said that the cut was “implausible” and would cost universities £10 billion by 2020. Labour may see this as a totemic policy but can they really afford it and what are its consequences? Do they really want to use this money to subsidise better off students when they could for example use it to put in place grants to help those who do not have resources at their disposal to fund their time at university? The Guardian has one of the most bizarre stories of the week, with yet another telling intervention by a UKIP candidate. This time it is Victoria Ayling, who is standing for election in Grimsby who, during a Question Time-style debate in Cleethorpes this week, prompting “guffawing” from the audience, when she asked: "What happens when renewable energy runs out?" Clearly, UKIP are not so much planning an election campaign but an apocalypse. The BBC report that Welsh councils broke data protection laws 100 times in 2014, but this is a fall compared with the previous year. The law was broken 135 times in 2013 and 60 times in 2012. Powys recorded the highest number of breaches in 2014 with 41 while Anglesey, Bridgend, Ceredigion, Merthyr Tydfil and Neath Port Talbot had none. BBC Wales submitted a Freedom of Information request to all 22 Welsh councils and 19 responded. Blaenau Gwent and Caerphilly failed to respond while Swansea did not deal with the request, saying details of data protection breaches are not recorded centrally. These things happen of course. I am aware of at least one breach by Swansea Council for example. But that does not excuse them. All data controllers under the Data Protection Act have a duty to take precautions to prevent these breaches from happening. On Monday night I attended a residents meeting in Crymyln Burrows, just off Fabian Way and opposite the new university campus. It reaffirmed to me the appalling lack of consideration by Neath Port Talbot Council and Swansea University towards this small community due to their failure to consult residents before authorising four weeks of overnight resurfacing work on Fabian Way, just yards from people’s homes. The public meeting was packed out but the Council and the contractor refused to send anybody to talk to or listen to residents’ concerns. The University was represented by their Director of Student Services, but he has no involvement in the building work and was not able to speak for the university on the issue let alone negotiate with residents. The way that the Council and the university has treated residents in pursuing this work is a disgrace. They have consistently refused to engage on the timing and the nature of the work, they have refused to answer valid questions and they have effectively acted as if they cannot care less if the residents suffer or not. It is little wonder that Neath Port Talbot came bottom of all 22 authorities for customer satisfaction in Welsh Government figures published yesterday. Basic courtesy and good customer relations would dictate that they should at the very least have attended the meeting with residents to talk them through what they are proposing and to listen to their views. Residents living in Elba Crescent and Baldwin’s Crescent have lives and jobs to go to. At least one works in intensive care. They need their sleep if they are able to live their lives and carry out their jobs safely. There are children living there who need to be awake and alert for school. There should be alternatives to the way this work is being carried out which will avoid the disruption that people are going to suffer. However, the council will not even discuss it with us. Amid growing disarray at the highest levels of Labour Party, the Shadow Chancellor said that asking for a receipt was “the right thing” to do and added that he would crack down on “aggressive tax avoidance” if Labour won the election in May. "I think the right thing to do if you are having somebody cut your hedge for a tenner is to make sure that they give you their name and address and receipt so there's a record that you paid them," said Mr Balls, speaking to John Pienaar on BBC Radio 5 live. He also refused to rule out scrapping tax loopholes like “deeds of variation” which the Labour leader used to reduce his family’s inheritance tax bill by altering his father’s will. But then today the Telegraph reports that Ed Balls and 11 other members of the shadow cabinet claimed expenses for cleaning, gardening or odd jobs without submitting receipts, seriously undermining the shadow chancellor’s own advice. Is this a case do what I say, not what I do? I am not the biggest fan of the Taxpayers' Alliance but their latest freedom of information request has thrown up an intriguing question. They have discovered that Whitehall departments lost over £5billion in one year in written-off costs, “fruitless payments” and errors. In the case of the Ministry of Defence civil servants spent £6 million on ear plugs which were found not to be fit for purpose. They shelled out £7.2 million on mobile mine detection capability for Warrior vehicles that was deemed unsuitable and they made a fruitless payment of £4 million due to the forward purchase of an inventory liability as a result of the early withdrawal from service of Sea King Helicopters. Now mistakes do happen, but seriously, £6 million on ear plugs? That must be enough for an entire country! The Hope not Hate blog records that the UKIP leadership has cast aside their selected candidate in Coventry South and imposed one of their favourites instead. This new candidate has a sting in his tail however. They say that Reverend George Hargreaves is a former music producer and songwriter, who promoted 80's pop acts Sinitta, Yazz and Five Star amongst others. His biggest claim to fame was writing Sinitta's hit records "So Macho" and "Cruising" which both became gay anthems in the 1980's, making George Hargreaves a millionaire from the royalties and which saw him later move to The Isle of Man as a tax exile. Hargreaves formed The Christian Party in 2005 and in 2007 saw the formation of The Scottish Christian Party, set up by Hargreaves to contest the Scottish Parliamentary elections. Hargreaves used the money, generated by the royalties of Sinitta's hit singles to fund the campaign, which had a strong anti gay message, describing homosexuality as "a sin" and calling for a hard-line stance against abortion and euthanasia along with supporting a return of the death penalty and withdrawal from the EU. The manifesto for the Scottish election contained proposals for the reinstatement of Section 28, banning of gay adoption and the prohibition of "acceptance or approval" of homosexuality in diversity training, outlawing embryo research and introducing mandatory Christian religious education into schools. His former flatmate and song writing partner was a gay man who died of AIDS. This didn't stop Hargreaves saying in one interview that HIV patients should be refused NHS treatment since their illness was "self-inflicted". Hargreaves also formed The Welsh Christian Party in 2007 and campaigned to remove the dragon from the Welsh flag, claiming that it was "nothing less than the sign of Satan". Another of Hargreaves campaigns was denouncing Manchester United as a "sponsor of satanic worship" for featuring a pitchfork-holding devil on its badge. The Reverend announced "We urge Wayne Rooney not to honour the devil by wearing this shirt nor kiss this badge" . The true face of UKIP emerges once more through this leadership-endorsed candidate. Labour activists are fond of blaming the bank for the economic mess they bequeathed to the current government. And of course they are now advocating punishing their bête noir even more for their sins against the economy and ordinary people. I am not opposed to a further levy on banking profits but I do recoil at the sort of hypocrisy and spin being deployed by Labour in this campaign. That is because their culpability in this crisis was clear at the time. Despite all their denials Labour's failure to regulate the banks properly and their mismanagement of the economy put the country in the position whereby even their own Chancellor of the Exchequer said in March 2010 that if Labour is re-elected public spending cuts will be "tougher and deeper" than those implemented by Margaret Thatcher. Those who deny that Labour had any role in deregulating the banks will be interested in this article in today's Telegraph. They have published a video in which Ed Balls is seen boasting of over-ruling the Bank of England as Gordon Brown stripped it of the power to regulate the City. Gordon Brown’s economic adviser is seen telling a senior journalist that the Bank strongly objected to the plan to hive off regulation of the finance industry to a new watchdog – but they had no “choice” over the decision. They add that the apparent pride Mr Balls and Charlie Whelan, Gordon Brown’s spokesman, took in disregarding the advice of the Bank and the Treasury's most senior civil servant risks embarrassing the shadow chancellor as his suitability to run the economy becomes a focus of the election campaign. A decade later, Parliamentary reports into the financial crisis concluded Mr Brown's watchdog had failed to sound the alarm over the brewing crisis at Northern Rock, and should have blocked the catastrophic takeover of ABN Amro by the Royal Bank of Scotland. Sir Martin Jacomb, a former Bank of England director, has claimed that the "disastrous" decision to create the FSA was driven by jealousy within the Treasury and a desire to rein in the central bank's power. The body was scrapped by George Osborne, and regulation of the City handed back to the Bank of England Governor. This is one crisis the Labour Party cannot wriggle out of. I am starting to feel sorry for Harriet Harman. She does not appear to be able to do anything right. First of all we have the patronising saga of the pink van, chasing women's votes and which promises to offer new and embarrassing headlines for Labour every day up to the General Election and now we have 'prettygate', where she is accused of suggesting to a prospective Labour candidate that she was too pretty for politics. Harriet Harman, who proudly unveiled the strategy, was challenged on the colour of the bus. “It is the correct colour. This is a One Nation Labour colour”, she said. Lucy Powell was asked about the implication that women lived chained to their kitchen tables. She said Labour wanted to reach out to women and “have a conversation about the kitchen table, and around the kitchen table”, not an “economy that just reaches the boardroom table”. As she spoke, her male colleagues Ed Balls and Chuka Umunna were at the British Chambers of Commerce, setting out Labour’s vision for business and plans for the macroeconomy. Gloria de Piero chipped in that she thought the bus was in fact “cerise”. Harriet Harman said it looked “magenta”. On second thoughts I don't feel sorry for Harriet at all. She has patronised us all for far too long. And if this is how Labour feel they can win over the votes of women then they may be in for a rude awakening. Personally, the premiere of the film Fifty Shades of Grey this weekend leaves me cold. It is not a film which I intend to go and see. But then I am not a member of the target demographic. For others though the book and the film has had unintended consequences. Last year firefighters responded to 472 calls involving people stuck in compromising situations, a year on year rise – they claim – since the release of EL James’ books. Over the last three years the total cost have spiralled to almost £400,000, with firemen called out to 293 incidents of stuck rings, including seven cases of men who had rings stuck onto their penises. It does not bear thinking about. My sympathy though is with the firefighters. 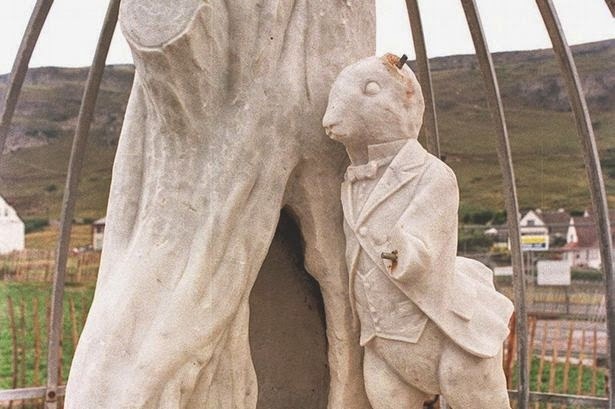 The Western Mail reports that the famous and historic Alice in Wonderland statue of a white rabbit is to be restored to Llandudno's West Shore. The Grade II listed statue was removed in 2012 after vandals repeatedly targeted it, including ripping off its ears. The restored statue is now to be watched over by security cameras in an attempt to protect it from further attacks. It will not however, be going back to the original location. Instead the rabbit will be positioned within the Llandudno conservation area, near a tram shelter, which is also Grade II listed, on West Shore. Eight-year-old Alice Liddell, who inspired Lewis Carroll to write his story, was taken to Llandudno for a family holiday in 1861 and the girl’s father had a house built at West Shore. The house was demolished in 2008. The marble statue of the rabbit was unveiled by Prime Minister, David Lloyd George in 1933 and had previously been kept in a steel dome cage. That cage will no longer be required. I spent many holidays as a child playing on the West Shore near to the white rabbit statue, so this restoration is very welcome. When it comes to fundraising the Tories are clearly in a different league to the other parties. This is evident by this story in the Times about last night's fundraising ball. In an attempt to depart from stereotypes, full-length gowns and dinner jackets were banned and the dress code was downgraded to lounge attire. Amid tight security, a swathe of senior Tories swept in to welcome guests paying up to £15,000 simply to be seated near them. Philip Hammond, the foreign secretary, and Michael Fallon, the defence secretary, were among the most high-profile names. The Tory party spared no expense, plying guests with champagne and red Bordeaux. A smoked salmon with horseradish starter was followed by a main course of confit of lamb neck with celeriac and haggis jus. For dessert, panna cotta with rhubarb and mint oil was served. Beyond the banquet, the real prize of the evening for guests was the proximity they enjoyed to members of the government. More powerful politicians came with higher price tags. While £5,000 bought a table with a junior minister, £15,000 was needed to secure a member of the cabinet. Individual tickets ranged from £500 to £1,500. City tycoons and hedge fund managers, accompanied by their spouses, were set to dominate the guest list, although there were celebrities and businesswomen too, with Nancy Dell’Olio, the television presenter Kirstie Allsopp and Baroness Brady in attendance. Henry Angest, a Swiss-born banker, and Ian Taylor, an oil billionaire, were among generous party donors expected to be present. Andrew Law, the multimillionaire chief executive of the trading and investment firm Caxton Associates, who has donated £1 million to the party, was also there. His wife Zoe Law, a celebrity make-up artist, presided over a board of 63 people as the event’s chief organiser. It is understood that a quarter of the organising committee are based in finance, while at least seven have attended private dinners with Mr Cameron. They say that details of the auction lots were closely guarded but the most expensive, which sold for £200,000, was a bronze maquette of Margaret Thatcher by Antony Dufort, a replica of the lifesize version that sits in the Commons. The star lot though was an opportunity to go shoe-shopping with Theresa May, the Home Secretary. The government is creating a new “false or misleading information offence”, which will make it a crime to knowingly give incorrect data to regulators or official audits. Hospitals face unlimited fines if they are convicted and could also be publicly shamed by being forced to tell patients or display posters about their lies. Senior staff who “consented or connived” in the deception could be fined or imprisoned for up to two years. The offence will apply to any information that hospitals are legally required to publish or submit to official bodies and is aimed at chief executives and senior medical staff. Ministers concede that it is likely to be used rarely, but the measure was condemned by doctors’ leaders who said it could make staff too scared to speak up. Since the end of last year, NHS organisations have had a legal duty to admit mistakes to patients, and the latest plans aim to penalise those that do not. Hospitals that cannot prove they have been fully open when facing a negligence claim will have to reimburse £10,000 to the NHS Litigation Authority, which pays out claims. This is all well and good but isn't fining hospitals just taking money away from frontline care? It is effectively transferring cash from caring to patients back to government coffers. I think they need to think this through more carefully. Today's Wales on Sunday highlight a growing issue in my region, namely the abandonment of open cast mine sites with insufficient funds to restore them. At Parc Slip in Margan, a 600 by 400 metre water-filled hole has been left behind which in the view of many could lead to flooding. There is also East Pit near Gwaun Cae Gurwen, which has also been left open and unrestored. We would need £115 million to restore land at East Pit but only around £2.5 million is available in the bond left by its former owners. At Parc Slip the fund stands at £5.5m of an estimated £57m needed. Last year the Welsh Government penned a report examining the problem. It named 10 mines in Wales of which five "may have insufficient bond cover at some stages of their operating life" to pay for land to be repaired. These were Ffos-y-Fran, in Merthyr Tydfil; Tower Colliery, at Hirwaun, in Rhondda Cynon Taf; Nant Helen, in Coelbren, Powys; East Pit, in Gwaun-Cae-Gurwen, Neath Port Talbot and Parc Slip at Kenfig, in Neath Port Talbot. These were owned by Celtic Energy, Miller Argent and Tower Regeneration Ltd.
Dynant Fawr, in Tumble, Carmarthenshire, had "effectively been abandoned in an unrestored state." That was run by the dissolved Dynant Fach Colliery Company Ltd. The Welsh Government warned cash paid by mining firms for land restoration "is not a panacea". "This is because it has to be accumulated at a rate which keeps pace with the restoration burden posed by the site at any particular stage of its operation," the report said. It cannot be set at "an unreasonably high rate" that would be "commercially unviable". Clearly, a solution has to be found that does not subject local communities to more disruption and years of misery. The Independent reports on the outcome of research by scientists that seems so obvious that I am surprised that they got funding for it. They have 'discovered' that there are two broad reasons why cats crave their own little cardboard castles. In this wild these small hiding places would have been a place to relax away from prey, but in a modern home puss is more likely to be avoiding an unwanted stroke from an owner. 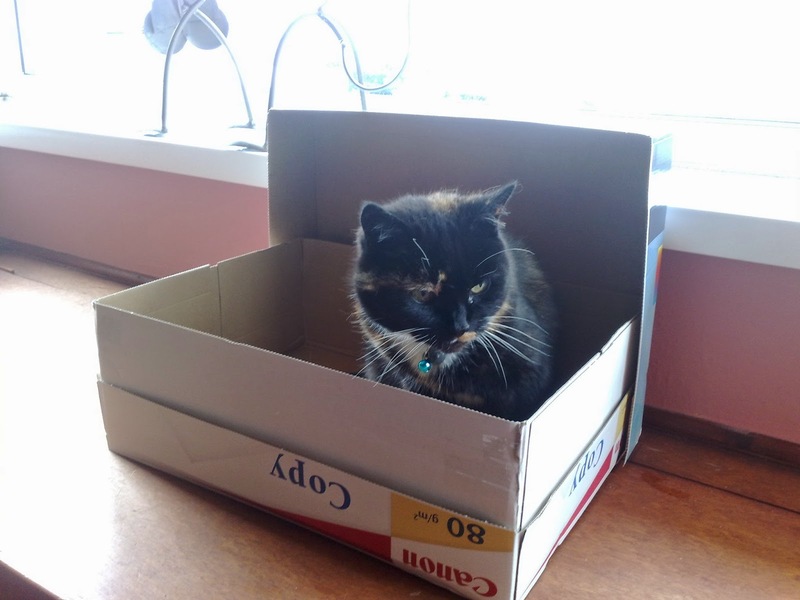 Another set of research conducted in 2006 by the National Research Council found that boxes can help keep a cat warm. Cardboard boxes are usually made of multiple layers of card to provide strength, which makes them a good insulator for cats who like to stay warm. So next time you see your cat chilling in a cardboard box, there’s a good chance they probably don’t want anything to do with you but wish you would turn the heating up. I dont suppose they could have saved us all money by just asking people who choose to live with cats. Yesterday's Guardian article in which a Labour donor has criticised Ed Miliband and Ed Balls for their memory lapses and mansion tax proposals is nothing really new. The paper says that Gulam Noon, who has given nearly £873,000 to the party, £100,000 of that since Miliband became leader, made his fortune from the manufacture of ready meals and is worth an estimated £75m has described the memory lapses the Labour leadership team as very embarrassing. This is a new one on me, but clearly I will have to try it. Those of us who use social media learn very quickly that it is a law unto itself. You cannot control it, you just have to be careful what you post and hope for the best. And if what you post has any traction then you will attract followers. That lesson does not seem to have to have filtered through to the Tory Party who, according to the Independent are reportedly spending more than £100,000 a month, or well in excess of £1 million a year, on its Facebook presence. The paper says that while the Tories see the money as a good investment in their attempts to reach more young voters, it does not appear to be working as well as they might like. That is because in terms of overall support, Britain First is almost twice as popular as the Conservative Party on Facebook, amassing nearly 650,000 likes compared to the Tories’ 340,000. More seriously, despite massively outspending Labour, the Tories' 341,293 'likes' is only marginally more than the opposition party's 332,916. When the Beatles sang 'money can't buy me love', little did they know that 49 years later the Conservative Party would be proving them right. Notwithstanding Ed Ball's embarrassing gaffe of failing to name the businessman who has been advising Labour, the official opposition's problems with the business sector are starting to get serious for Ed. Miliband. Lord Jones of Birmingham, who served as trade minister under Mr Brown, said that he had not yet heard Ed Miliband utter “one word about why it’s good to make profit in Britain”. It came as a series of business figures raised concerns about Labour’s view of the corporate world after its bust-up with the billionaire boss of Boots. They questioned Mr Miliband’s treatment of Stefano Pessina, who declared over the weekend that a Labour government would be “catastrophic”. The Labour leader slapped down the Monaco-based businessman by accusing him of avoiding tax. Brent Hoberman, the founder of Lastminute.com, accused Labour of trying to “intimidate people into not voicing their opinion”. He said that France had shown that anti-business rhetoric could force entrepreneurs overseas. “We should be concerned about the opinions of those who invest in the UK,” he said. “Whether they are living here or not, they are important in a global economy. “What we’ve seen in France is that anti-business rhetoric is more damaging than the policies — that entrepreneurial success was somehow not a worthy aspiration. Richard Caring, the restaurant tycoon and a former Labour donor who now supports the Tories, said that Labour was trying to win “cheap votes” by attacking business. “When you look back at Blair when I was a Labour supporter, he was very clear on being supportive of business and creating business. It wasn’t so much about trying to gain a cheap vote by trying to hit people that appear to be successful,” he added. Jacqueline Gold, chief executive of Ann Summers, Sir Martin Sorrell, chief executive of WPP, Stuart Rose, the former Marks & Spencer boss and Tory peer, and Sir Ian Cheshire, the former B&Q chief, have also raised concerns. This is one trend Labour are going to have to reverse if they are to regain any reputation for economic competence. Well, not so much a debate as a bloody great row. The Western Mail has the latest on the shouting match that has erupted as a result of the Secretary of State for Wales' comments on the Welsh Government's failure to improve our education system. Anybody would think there is an election coming. It all started when Mr. Crabb described Labour’s stewardship of Wales’ schools as a “much bigger scandal” than its handling of the health system. He said that Wales had slid down the international Pisa rankings and cautioned that basic skills such as reading, maths and foreign languages need to be improved in schools, while he also said there had been a worrying drop in the number of pupils and university students studying IT and computer science. The Secretary of State is absolutely right of course and the classic Welsh Labour response of claiming that he and his fellow Tories are conducting a 'war on Wales' has no credibility. It is perfectly legitimate to hold the Welsh Government to account for their performance in the same way as Welsh Ministers seek to scrutinise what their UK counterparts do in whilst answering questions in the Assembly chamber on a daily basis. My only concern is that amongst all the shouting and point-scoring, it is the pupils and learners who are being forgotten. They are our number one concern and it is they who are affected the most by the Welsh Government's failure to deliver. the move is “highly irresponsible and fails to deliver what consumers want,” adding “we think it’s a con, because the energy companies will all shove up their prices before and certainly shove them up afterwards, so the consumer won’t get any benefit. ”Mr Davey said that the price freeze would hit the small, independent, gas and electricity companies much harder than the Big Six suppliers. Now the Telegraph reports Mr. Davey has been proved right, even before Labour have had a chance to implement their freeze. Energy companies are failing to pass on the full falls in wholesale prices because they are afraid they will not be able to cover their costs if prices rise again under a Labour Government, industry analysts say. Companies should be able to afford to cut prices by "a double-figures percentage", Ann Robinson of price comparison site uswitch said, with average gas and electricity bills currently about £1,300 a year. “We believe that Labour's price freeze proposal has been instrumental in the failure of the big six energy suppliers to reduce their standard prices, despite the significant fall in wholesale costs,” she said. Mr Stanojevic said that Ed Miliband’s “ill-conceived” price freeze was one of the main reasons for companies’ failure to pass on reductions, because if prices rose after the start of a price freeze “suppliers could make losses”. “Counter intuitively, the proposed freeze has therefore caused consumer energy prices to be higher than they could otherwise have been at this time,” he said. In Ed Miliband's world this amounts to be careful what you wish for, because it is consumers who are suffering. If Ed Miliband thought that the approaching General Election would unite his party behind him then he might need to think again. According to today's Sunday Times, senior Labour figures have warned that the party faces a new civil war over the party’s direction whether Ed Miliband wins the general election or not. They add that Blairites in the shadow cabinet are planning to demand that the Labour leader backs more radical reforms of the public services if he becomes prime minister. And in the event of a Labour defeat, the group of frontbenchers, dubbed “Neo Labour”, wants to back a “healing candidate” for leader to end the Brownite stranglehold on the party represented by Miliband and Ed Balls, the shadow chancellor. After a week of chaos a new war of words erupted last night between old and young Blairites and left and rightwingers. Patrick Diamond, a former adviser to Blair and Lord Mandelson, said Labour still lacked “settled” policies on the economy and the public services and warned that differences could not be swept under the carpet for much longer. Diamond criticised Miliband’s decision to “draw a line under the entire period” of Blair “and say that most of what Labour did was wrong or is now irrelevant”. Liz Kendall, the deputy to Andy Burnham, the shadow health secretary, said that Milburn had been “plain wrong” to speak out. Last night three more leading Blairites elected in 2010 rounded on Milburn and Hutton, telling them to shut up until election day amid fears their intervention will damage efforts to push Miliband to the political centre ground. It really isn't looking very encouraging for Miliband at all.